Dogs simply love being outdoors, and walking is essential to a dog’s health and overall well-being. Taking your beloved canine for a stroll promotes fitness, encourages social skills, and enables your dog to explore new surroundings. 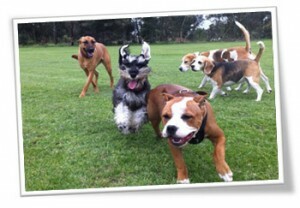 With our dog walking service they will experience all this and more! 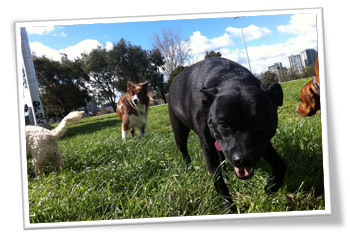 At Urban Paws we provide ‘group dog walking’ to the area’s best dog-friendly parks, as well as outings to the beach during the warm summer months. Our dog walking service consists of a steady one hour walk which excludes the time we allow for pick-up and drop off. 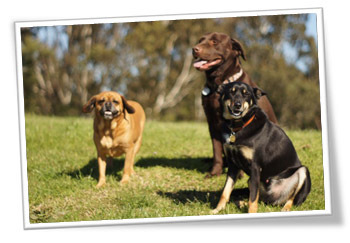 We additionally offer options of shorter walks to suit your new puppy’s or aging dog’s needs. Altona, Ascot Vale, Flemington, Footscray, Kensington, Kingsville, Maribyrnong, Newport, Seddon, Spotswood, Williamstown, Yarraville. Reflecting on the last year and a half using your service I wish to thank you and your team for your dedication, care and trustworthiness. Lenny (now 11 year old Vizsla) was not well socialised and this started to become a problem. We had previously engaged 2 animal behavioural trainers. 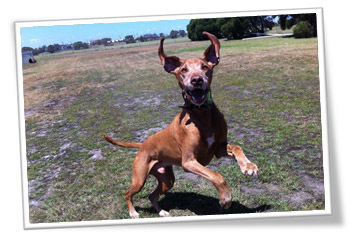 Whilst they were somewhat helpful for us, Lenny’s success is greatly attributed to your attention, professionalism, compassion and animal intuition. Now when we walk Lenny it is a joy! We often remark how far he has come – he actively seeks out and is interested in playing with other dogs, he is not fearful and does not display any ‘snappy’ behaviour. Lenny loves his walk days and has become a friendly well socialised dog that we knew he could be. We also have peace of mind knowing that he is having a fun day out exploring parks and beaches with his doggy friends, whilst under diligent supervision. We highly recommend Urban Paws. We congratulate you on creating a high quality service that is trusted and ultimately that displays genuine care for the pets it services. All dogs must be desexed if older than 6mths. Proof of current C5 vaccinations and must be on a scheduled treatment for fleas & worms. Performed and passed an evaluation test on social skills prior to acceptance into the day care. Puppies must be a minimum of 12 weeks old. All dogs must be on snap or buckle collars - no haltis, choker chains or harnesses allowed. Must be in good general health with no symptoms of cough, diarrhoea or vomiting.